I have over thirty years’ experience in Government, Non-Profit and Community organizing. 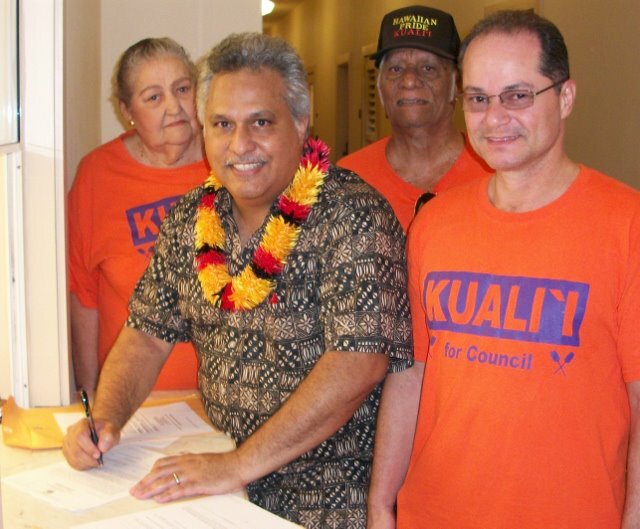 I’ve worked with community leaders helping bring an enterprise center to Kekaha; and, a certified kitchen, marketplace, solar farm and tiny homes project to Anahola. I’ve also worked with community organizations promoting sustainable agriculture, civil rights, youth & community programming and renewable energy. KipuKai was raised in a large, working class, sugar plantation family in Old Puhi Camp by parents (Patricia CARVALHO & Wilfred KUALI`I) who taught them to be resourceful, work hard and take care of our island and each other. His dad, a pure Hawaiian hanai (adopted) son of the Corr (Makanui) family, grew up in the taro patches and salt ponds of Hanapepe. He shared with them those experiences along with his proficiency as a paniolo (cowboy), hunter, fisherman and gardener. The family never knew times were hard because of all that Kaua`i provided them. On the Council, KipuKai will fight to protect our `aina (agricultural lands, natural resources and public access) for future generations to enjoy and rely on as they did.